Your most powerful ally in your noble struggle for decency is your religion. It takes you by the hand, guiding you over the pitfalls that beset your way, and puts your feet safely upon the paths that lead to the sunlit mountain peaks of nobility of character and purity. Not only does it make clear the moral law and supply sanctions for its observance, but it offers you aids to carry out that law. With God’s all-powerful help, you can win every victory. This grace of God is obtained through the sacraments, prayer, self-denial, and a tender love for Jesus and Mary. Regular confession keeps your soul in order. It is God’s means of ridding you of and preserving you from the greatest evil in the world—sin. For this reason it is a source of peace and joy. V. You get back the merits of the good works you have lost by mortal sin. Remember that the most important part of confession is not so much the telling of your sins, as perfect sorrow for them. Your contrition is perfect when you are sorry because your sins offended God, whom you should love above all things for His own sake. But contrition is also a hatred for the sins you committed, with a firm purpose of sinning no more. This means that you must really want to make up your mind not to sin any more and to try hard to keep away from whatever leads to sin, such as bad companions, bad places, bad reading. If you do not really want to keep away from mortal sin and from whatever will surely lead you into it, you make a bad confession. I. If you have real mortal sins to confess, then you must tell what you did and how often you did it. A confessor must know the kind of sin (self- abuse, immodest embracing, fornication) and the number of times; otherwise he may not give absolution. This does not mean’ that you must give a detailed description of your thoughts or acts. II. If you are confessing sins of impurity and you mean only venial sins (negligence in regard to thoughts, lack of sufficient reason in external acts) or mere temptations (imaginations or feelings that were not willful), then indicate this to the confessor by saying, “I had bad thoughts, but they were not willful” or “I tried to get rid of them.” Otherwise he may think you mean mortal sins. III. If you wish to confess doubtful sins (you doubt about consent, or whether you confessed the matter before), mention your doubt. Strictly speaking, doubtful sins do not have to be confessed, though it is better to do so, unless your confessor decides otherwise. Nor do you have to abstain from Holy Communion when you merely doubt whether you have sinned. You must be absolutely sure of having committed a mortal sin before you can say that you are not able to go to Communion. However, you should make an act of perfect contrition which will dispose your soul for the reception of the Sacrament. IV. 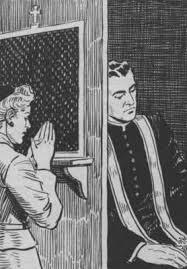 If you have difficulties in regard to chastity or if you are inclined to be scrupulous, you should have a regular confessor. His advice will be more valuable since he will know the condition of your soul and the problems you must meet. Trust him, for God commissioned him to be your friend and your soul’s guardian. Go to Confession every week or at least once a month. This will enable you not only to cleanse your soul from sin, but also to correct your faults and keep yourself pleasing to God. It is one of the best means of keeping courtship clean and happy.